If you do need dentures, your best option is to stabilize them with dental implants. When a denture is placed over dental implants, that is called an implant overdenture. This solves most of the problems associated with dentures. Many patients tell us it feels just like having their natural teeth back. Four or six dental implants would be ideal, but as few as two can be a tremendous help and can keep the denture in place and prevent complete resorption of the bone. With two implants, the attachment between the implants and the denture needs to allow some movement. The picture shows a snap attachment, which protects the implants against torquing forces. With four or more implants, the denture can be screwed securely into place, and it will feel like you have your natural teeth back. The more implants, the more stable and secure the denture will be. You can eat and talk normally without worrying about your denture falling out at embarrassing times. The bone is preserved in the area around the implant site, which prevents facial collapse. Implant overdentures are more comfortable than removable dentures because the implants prevent movement of the denture which can cause sores. 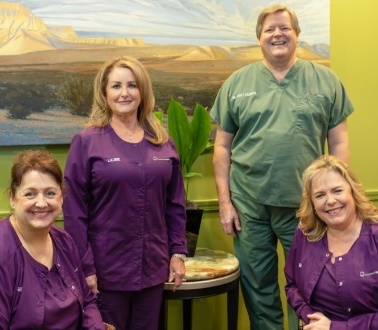 Dr. Coleman has been placing and restoring dental implants for over 30 years, and has earned Fellowship status with the International Congress of Oral Implantologists. He stays current with the latest dental implant technology and can help you understand all your options. He also respects the limitations you may have with your budget, and will not push you into options that you don’t want. If you have questions about whether or not you are a good candidate for dental implants. Call us at 713-783-2800, or visit our request an appointment page.